Snack time! Rethink your “snacks” and think of them as “mini meals” that can bridge the gap between main meals and provide more plant-based foods. Snacks should have 2-3 different food groups to be balanced. Laughing cow cheese wedges are a favorite of mine and my 5-year-old. It’s just enough creaminess for veggies and fruit. Neely eats 1 with apple wedges often. I’ll take two, because why not. 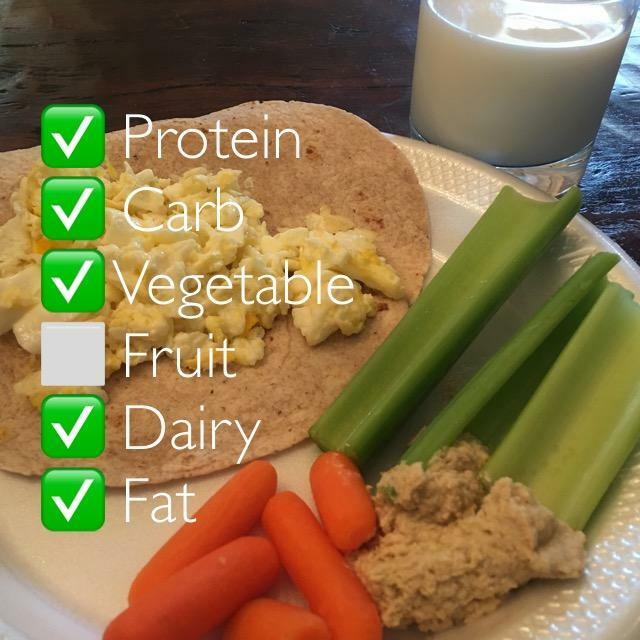 1 Egg + 2 Egg whites wrapped in a high fiber tortilla, paired with veggies and hummus (with a large enough serving that it’s my fat), washed down with an ice cold skim, Fairlife. Greek yogurt offers the perfect creamy texture for whole grain oats, with blueberries. If you haven’t tried peanut butter in your yogurt (or with raw oats) you’re missing out! This can also make for an easy week night meal, when cooking isn’t moving your spirit. Snack time! Nothing like protein packed, key lime yogurt with a tasty kiwi on top! *Remember, snacks need 2-3 different food groups to be balanced and manage blood sugar best. 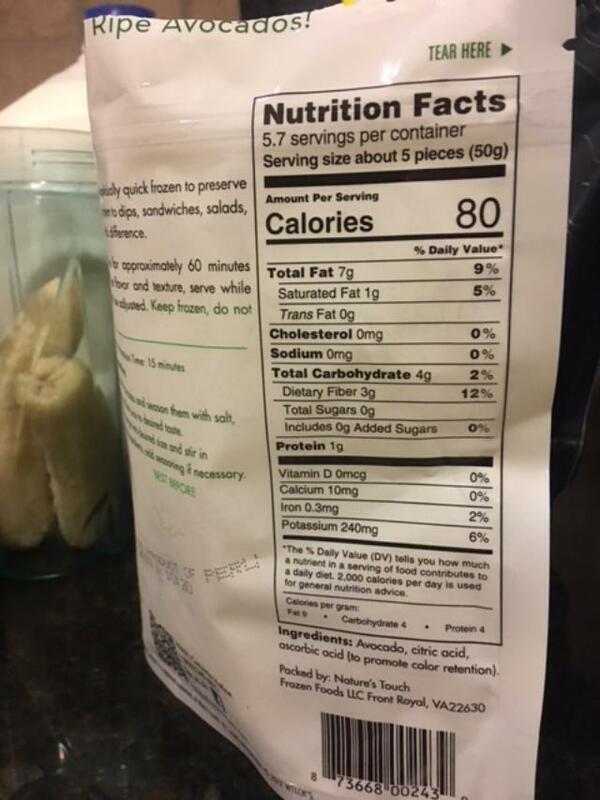 The dark check is because the protein is nestled inside a serving of dairy. Whether you need a *snack* or depends on your schedule, your eating patterns and size of your last meal. 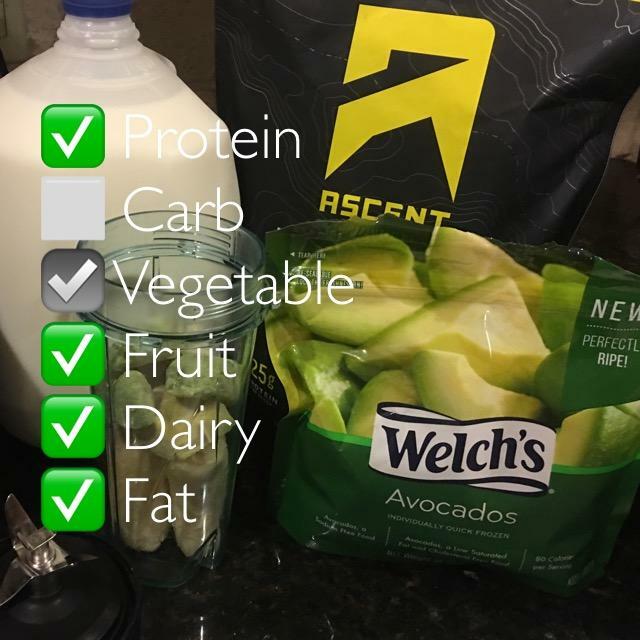 If you are an athlete trying to get in an afternoon workout or practice, I do recommend a pre-exercise snack to help you perform your best. This is a fabulous option. Breakfast: 3-5 different food groups. I like raw oats in my yogurt. You should try it. Since I’m lifting heavy during this season, I’m focused on getting plenty of protein at every meal. The small individual yogurts have 12-15 grams of protein, that an appropriate amount for most. You can try adding a scoop of protein powder into your yogurt for an extra boost. That’s what I did here, and it’s delicious. Topped the raw oats and yogurt with slivered almonds for the fat. This would make for a great afternoon snack, too. If I had a fruit in the house, I would have added it. But my cabinets were Uber sad. Ha! Zero connections with these brands. Not an advertisement, just my personal favorites. Enjoy the rainbow by eating it. Breakfast needs 3-5 different food groups to be balanced. Greek yogurt provides you a powerful protein and dairy. Fruit galore (really it is one cup measured of mixed chopped fruit) and about a 1/4 cup of whole cashews for a heart healthy fat. This is a simple breakfast, snack, or even a late night meal, when your other choice was cereal or nothing. Remember- every food group brings a wealth of nutrition to the table. Not all food groups have the same nutrients. A variety of food groups at each meal means you’re get a spectator spectrum of nutrients! My breakfast on-the-go took less than a minute to prepare. Muscle building protein from Greek yogurt, energy carbs from my fruit, and a healthy fat from slivered almonds. *No relation to these brands. Fairlife is a unique milk that has been ultra filtered to provide 20g of protein per cup. (This is not a sponsored post, I enjoy the product) pair it with whole wheat toast, peanut butter and a banana. When I hit the gym in the morning, I don't feel like a "hot meal" for breakfast. Plus, in usually running out the door because I drag to the shower. Anyway... homemade smoothies can help get you fueled up and out the door the right way. Protein came from a whey protein powder. No "carb" in the form of whole grains. Fruit was 1 cup of frozen mixed fruit. Dairy came from 1 cup cows milk. Fat was provided by 1 T peanut butter. I'll be full and satisfied for a while. What did you have for breakfast?! A late, lazy breakfast can still be balanced. Taking time to drink an extra cup of coffee in bed, pushed breakfast back a while. But that doesn't mean a lazy, late breakfast can't be balanced. You need 3-5 food groups at breakfast. Here I got protein from my dairy: Greek yogurt. Carbohydrate came from old fashioned oats, raw. The apple gave me a fruit serving and the spoonful of peanut butter, my healthy fat. I don't know about you, but I'm still recovering from my calorie coma from Christmas. Sometimes dinner needs to be light, high fiber and easy to make. Amen?! Amen! Old fashioned oats rolled into plain Greek yogurt with fresh fruit. Please tell me I am not the only human that enjoys raw oats rolled into yogurt? The texture and taste is delicious. *This actually makes a good breakfast and/or post workout snack. This is another simple, super quick and long lasting morning meal or post workout snack. Fairlife milk is ultra-filtered and has 50% less sugar, but packs 13g of quality protein per cup! And the fat-free is only 80 calories (for 13 grams of protein)! PB&J Oatmeal is a favorite (even with kids). See how this meal rates. And - Incase you were wondering, I stirred it all together before eating. Snack time is my favorite time, every time. Just mix about 1/2 cup of dry old-fashioned oats into a container of Greek style yogurt and stir. Enjoy. Snacks should be thought of as "mini meals" not "treats". Use snacks as an opportunity to get in another fruit, vegetable or dairy serving (since we can lack those at main meals). A balanced snack will provide 2-3 different check marks. Here I snagged 2 (but 3,ha). ✅ Fruit with the cup of grapes. ✅ Dairy with the cottage cheese. Don't have a wimpy snack of just fruit or just yogurt or just something out of the vending machine. Rate your snacks to make them count. This is my second "mini meal" of the day. Some would call it a "snack" but I'm not a fan of that word. After a good workout- I like to give the body more than a "post-workout snack".